Netflix reported their quarterly earnings today, and the news was mostly–though not entirely–good. Revenue was $519.8 million, up 27% from the year-ago quarter, but fell a few million short of Wall Street expectations. As a result, the stock was down nearly 10% in after-hours trading. But the number of subscribers is up 42% from the year-ago quarter, up 2 million from last quarter–and there are sure to be more as Netflix expands northward into Canada. There are also some very encouraging signs for Netflix’s streaming video empire, even more interesting to those of us who have been following the company’s transition to non-physical media. 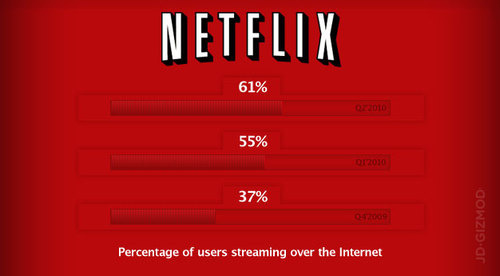 Of the now 15 million Netflix subscribers, a whopping 61% have streamed some sort of video for more than 15 minutes. That’s way up: Only 37% did the same in the year-ago quarter. But that has a slightly unfortunate effect on Netflix’s business. Though many customers now use Netflix for its streaming capabilities than its traditional mail-order DVD and Blu-ray business, the company’s pricing is still disc-based. So there has been a shift toward the cheapest possible option that still allows for streaming video, the $8.99 plan, because discs are becoming less important. Netflix’s average subscriber price, in turn, has lowered from $13.29 last year to $12.29 this year. It’s not surprising, but it’s something Netflix will have to think about.